Dr. No is a 1962 spy film, starring Sean Connery, with Ursula Andress and Joseph Wiseman, filmed in Jamaica and England. 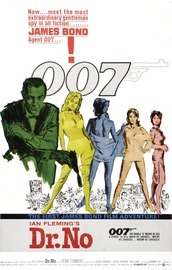 It is the first James Bond film. Based on the 1958 novel of the same name by Ian Fleming, it was adapted by Richard Maibaum, Johanna Harwood, and Berkely Mather and was directed by Terence Young. The film was produced by Harry Saltzman and Albert R. Broccoli, a partnership that would continue until 1975.